Rhododendron rainbows – it’s a family thing! This bright yellow rhody is in our back yard, actually it IS our backyard! So bright, it seems to glow even at night. Here in maritime Northwest rhododendrons are ubiquitous this time of year. The tiniest little ramshackle house, hidden behind a huge plain green bush eleven months of the year, barely noticed, suddenly is eye-poppingly beautiful when covered with huge bright red or pink blooms. I didn’t intend to be a “Rhody” person. A fan of pollinators, I find rhododendrons are not that useful to most pollinators – hummingbirds and butterflies have no interest in them and bees seem picky, liking some varieties but not others. 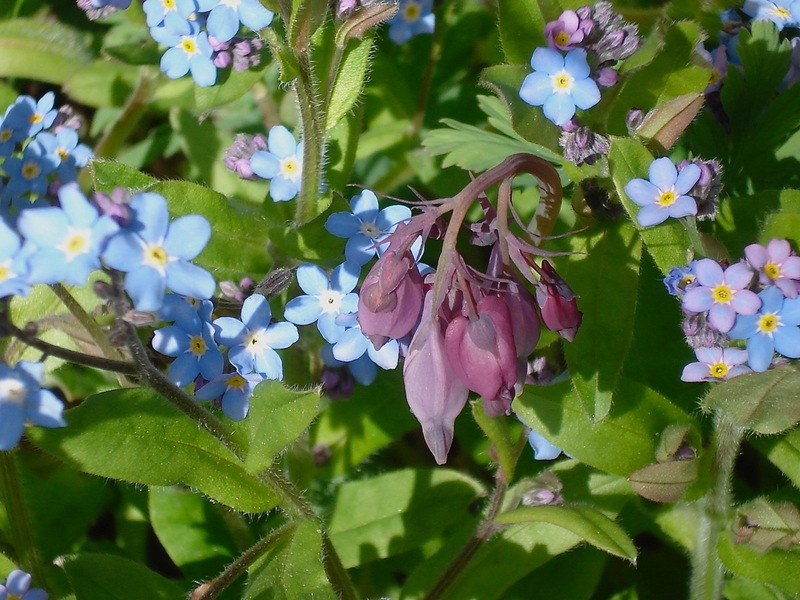 Highly hybridized, most plants have one big showy spring bloom then sit quietly in their evergreen garb the rest of the year, blending into the landscape. But over the years I’ve grown to appreciate their abundance of color and have loved individual plants as though they were pets. It must be a family trait, both my parents loved rhododendrons, and one of my brothers has planted many here on family property, late-blooming varieties and ones known for their unique foliage. A new & current favorite, this variegated peach colored rhody is in a pot where we lost to drought a 20+ year old, hot pink rhody. I still miss it, a favorite, it consumed our front steps, greeting us coming and going. This year, a more typical northwest spring than we’ve had for several years, has made apparent one primary value of rhododendrons – in spite of cold, gray, wet weather, front yards and public parks everywhere are lit with the bright hues of rhodies. People make their annual pilgrimages to the many public rhododendron gardens to enjoy this rhododendron festival of color. A small rhododendron, grows only about 18″ tall. Pacific Rhododendron, Washington State flower, less abundant but still found in many wild places. Rhododendrons were first “discovered” by Europeans in the Himalayan Mountains and other mountainous regions of Southeast Asia , where hundreds of varieties are native. 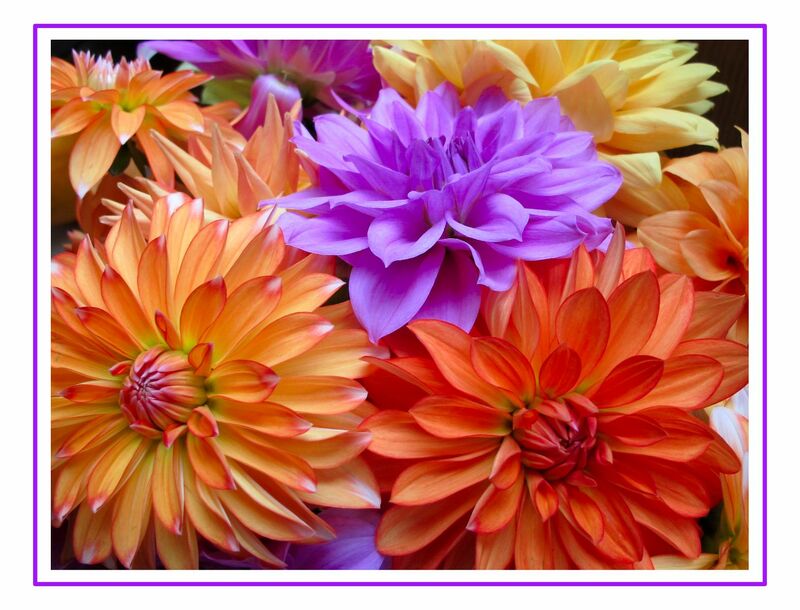 They are the national flower of Nepal, where they grow abundantly. Archibald Menzies “discovered” the Pacific rhododendron in 1792, though they were certainly already known to native people. (An interesting paper on the history of the Pacific Rhododendron is found here.) Rhododendron leaves are highly toxic (though I had a Jersey cow, Daisy, who ate some and seemed unaffected, but I wouldn’t recommend it). In traditional cultures wherever they grow wild, rhododendron leaves have been used as poultices for arthritis pain and headaches. in spite of thick leathery leaves, occasionally some bug finds one that is tasty. Rhododendrons have been hybridized to have many colors, scents, leaf color and shape variations, to grow to different heights, and bloom at different times, from the winter blooming Christmas Rhody to ones that bloom in June. 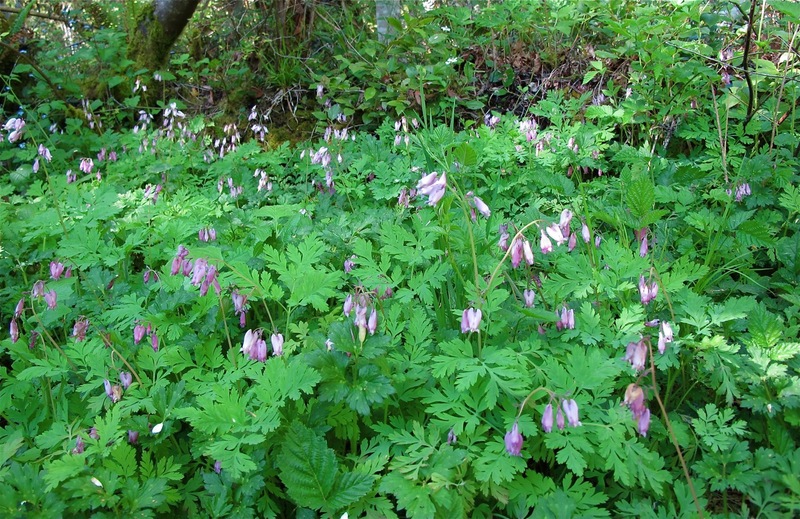 The ones we grow bloom early to mid-spring. Except for a rare bug nibble, the primary pest problem we’ve had are mountain beavers who chew off branches and carry them to their dens, where we find piles of branches. This has done serious damage some years, one young bush completely ‘harvested’ to the ground. Larger bushes are “pruned”, not at all aesthetically, destroying many buds. We’ve also lost a few bushes to drought. But in our woodsy environment most thrive and have long lives. Shallow rooted, though we give them big planting holes with lots of “good” soil, as long as they get some leaf mulch, they seem to tolerate our clay soil. This is our Christmas rhody, the first to bloom, though not at Christmas where we live. Rhododendrons come in all sizes, some can be pot grown, some like more sun, others more shade, many different bloom “styles” appeal to people’s personal sense of what makes a pretty flower, and you can probably find one in your favorite color. I highly recommend, if your climate is right, growing rhodies for the pure benefit of color therapy, especially wonderful on a gray spring day. Mom and I, squinting in the sun in front of a huge rhododendron at her house in Seattle. Happy Mother’s Day Mom, you live on in spirit in the many flowers we both love! The rest of the year rhododendron’s shiny forever-green leaves remind us of eternal life. I’m quite sure whatever corner of heaven my parents are hanging out in, they have planted rhododendrons! 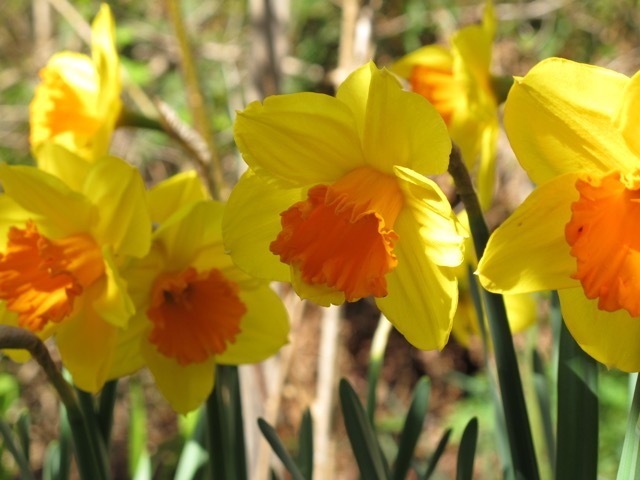 Candlemas & Imbolc – Take a break, celebrate the returning light & have some comfort food! February 1 & 2 fall mid-way between the Winter Solstice and Spring Equinox. The most ancient of cultures would have noticed this as a good time to have celebration and ritual. It is the downhill side of winter survival, a time of hope for the future, yet also a time of weariness of winter hardships. People were ready to celebration, to begin preparing for the coming planting season, to honor those who could assure them a successful harvest, and to rejoice in the returning light. It’s a time to clean out the ‘cob webs’ of winter. In Celtic tradition this mid-winter time is celebrated with the Imbolc Festival on February 1. The first written reference to Imbolc dates to the 10th or 11th Centuries in the writings of Irish monks. How extensively it was celebrated throughout the Celtic world no one knows for sure, but ancient Celtic architecture emphasizing alignment with the sun at this midway time in its cycle indicates celebrations go back much further. The Gaelic word Imbolc means “in milk” or ” in the belly”. Foods and beverages made with milk (especially ewe’s milk, as it is the time of lambing, thus fresh milk was available from the ewes) would be prepared, and milk beverages would be used to bless agriculture implements, such as a plow, and poured on orchard trees for fertility in the coming growing season. Homes would be blessed and candles lit. In Ireland, the day is celebrated as the festival of St. Bridget and blends ancient Celtic traditions with newer Christian traditions. St. Bridget herself seems to bridge the Celtic world, as her predecessor was the Celtic goddess, Brighid. Brighid (whose name has many spellings) represents light in many forms – candles, fire and Sun. Foods symbolic of the sun (see below about foods) would be part of the festivities. There is still debate as to who was real and who was mythical, the saint or the goddess. There are certainly overlaps in what each of them represents in their particular spiritual tradition – who they protect, and what their role is in handing out blessings. You can read delightful stories of both. I’ll go with the idea that both were real, and stories and tales down through the ages made them both mythical. I’m always ready to embrace a belief in a strong, benevolent woman who did good things and hands out blessings! I’m sure it is more than coincidence that Brighid and St Bridget have the same name, and both are seen as the personification of light returning and new life. Most Christian holidays follow in the footsteps of, and use many of the same symbols as, pre-Christian holy-days, it was the best way for people to incorporate the old with the new. February 2 is Candlemas, celebrating the 40th day after the birth of Jesus, the first day his mother could take him to the temple. At the time of Jesus’ birth women had to wait 40 days after giving birth before entering a temple, a period of time they were considered ‘unclean’. On the fortieth day Mary could enter the temple with her baby and have him blessed, so the day is often called “the Presentation of Christ”, or the “Blessing of Christ”. This celebration is observed in many Christian churches, such as the Eastern Orthodox Church and the Catholic Church. During Candlemas the candles that will be used in the church throughout the year are blessed. It is also a time of celebrating light, and of purification. There are many versions of these celebrations, many traditions and interpretations. In reading about them, what appeals to me is the preparation for spring planting and the new cycle of life, as well as receiving the blessing of returning light. It might be a challenge to celebrate hope and light, or seem irrelevant to do so at this time of such darkness and decline in the world, especially here in the United States. But perhaps that is even more reason to do so. 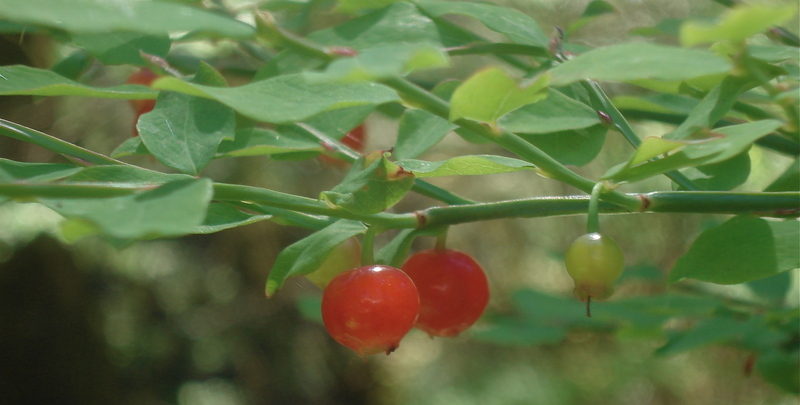 Create your own ritual for blessing your home, fruit trees if you have them, and perhaps your garden. Lights candles, inside, outside, and do whatever “purification” and cleaning out you feel inclined to do in your physical environment, make it your place of refuge from the darkness. Make some special foods (food ideas below). Allow yourself to feel blessed by Brigid, either in her Celtic form or Christian manifestation. St Brigid is associated not only with spring and fertility, but also healing, poetry and smithcraft. Write a poem, plant some primroses, sow some early seeds. Let your spirit and your mind take a break and celebrate the light. It is here, we just have to let it in. And if all else fails to arouse hope in you…there’s always Mr. Groundhog, the ‘ancient’ American seer of weather! There are no “executive orders” for canceling the coming of spring, so embrace it. See below for foods and recipe. For fabulous, fancier recipes for celebrating Imbolc , I recommend one of my favorite blogs: Gather. Lacy green leaves dabbled with lavender mix with tiny white flowers and border the entire length of the trail as I walk in the woods. 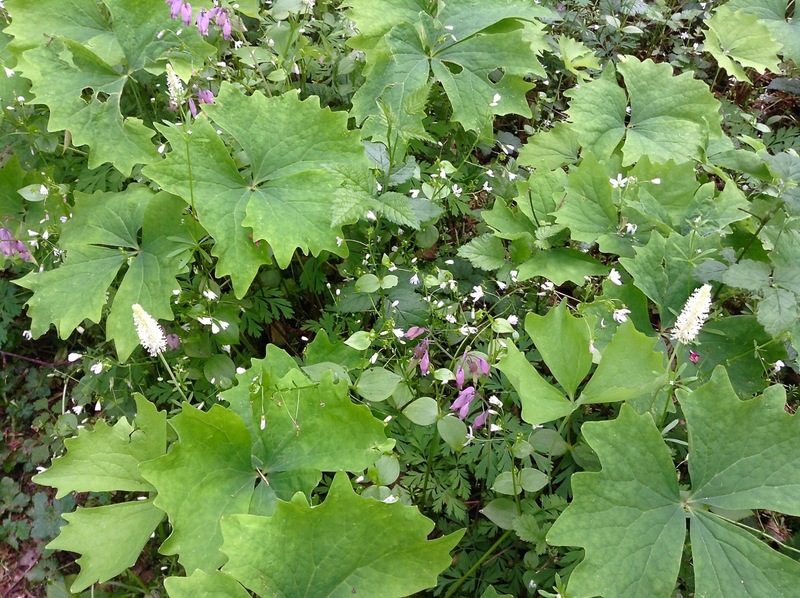 Stepping over vanilla leaf plants crowding into the path, I marvel, as I do every year, at the fairyland created by the wild bleeding hearts and miner’s lettuce. 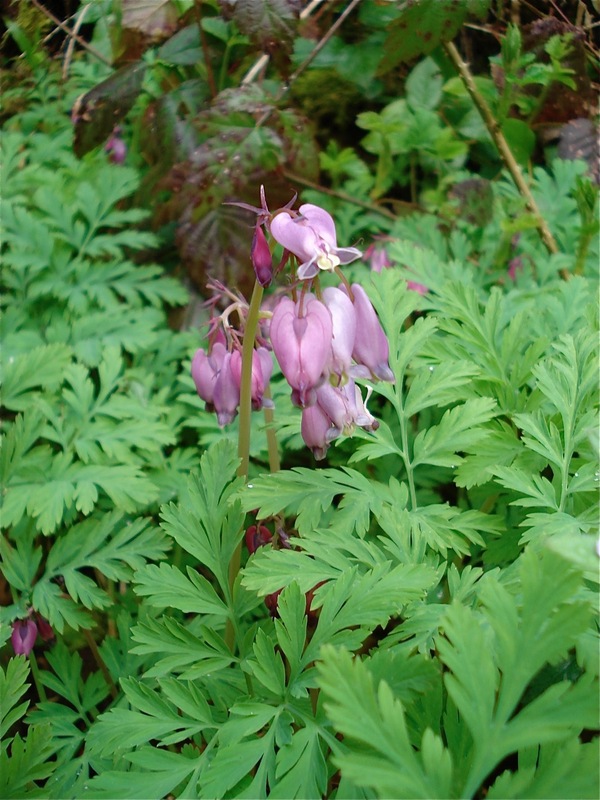 Bleeding hearts cascade into the backyard, mixing with blue forget-me-nots. It’s magical. Mother Nature is a master landscaper! I’ve likely written of this magical time in the woods before, and perhaps shared the poem below, but it seems appropriate on this day of celebrating Mother Earth to post a poem written by my father, a life-time member of Nature Conservancy, active in the Sierra Club, and who once told me “John Muir is my guru”. To bless the life cycle renewal of yet another spring. Been wanting to write something Easterly or springy, but the mind has darted and danced around in other places this week. 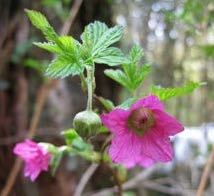 Yes, Easter and spring are in the “air”, a favorite time of year for me, a time when Nature expounds on and explodes with rebirth and rejuvenation, setting a fine and beautiful example for new beginnings. Yet, as much as I feel those energies, I am drawn to my inner world of memories and concerns. 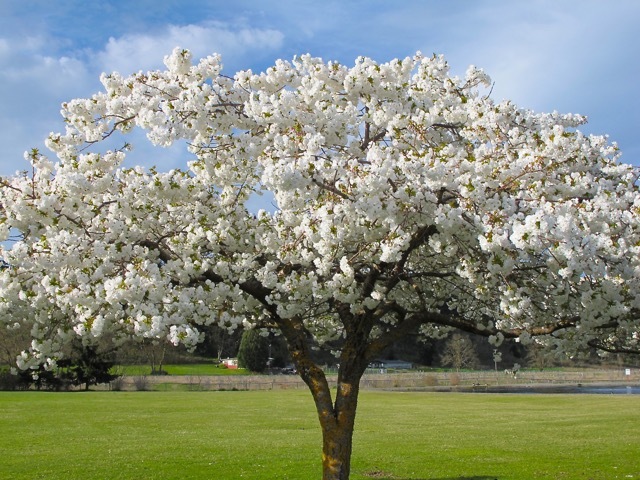 gorgeous flowering tree in Carrie Blake Park, a favorite dog walking spot of ours in Sequim. I took mom there once to see the ducks. Concerns are cancer related. A short reprieve from a medication ends. I am to go back on it…for five years. I have questions doctors and internet searches can’t answer, symptoms and side-effects difficult to live with, and fears hard to set aside. In other words, I’m human, living in a body that doesn’t always cooperate with the program. Watching the PBS 6 hour documentary this week on the history, ups and downs of knowledge, treatments, and attitudes about cancer reminds me cancer is a foreign landscape we still know relatively little about. The film ended with a recent “theory” – each person experiences cancer uniquely. How it manifests in someone makes it their own personal disease, explaining wide variations of response to treatments. I’ve observed this in myself and those I know who have struggled with cancer, whether they chose ‘conventional’ or holistic approaches to treatment. Interestedly, it seems allopathic medicine is recognizing what ancient healing modalities, such as Ayurveda, have known for thousands of years….. it is the person that needs to be treated, not the disease. Latest cancer treatment research focuses on bolstering the immune response in an individual. Unfortunately, these treatments are still in the research stage and been used successfully for only certain cancers. Well, I did not want this post to be about cancer, it’s only one of the mind distractions. The other does have to do with the season. This week is not only Easter, April 3 is my mom’s birthday, the first she is not here to celebrate. She would have been 94. This year it comes as Easter weekend unfolds. For the past decade Mike and I have spent every Easter with mom, and we have celebrated each of her birthdays with fanfare! Over the years we’ve taken her on fun trips around her birthday, had parties with friends and family, sometimes just had quiet, lazy weekends here watching spring unfold in the woods. Mom loved Nature as much as I. 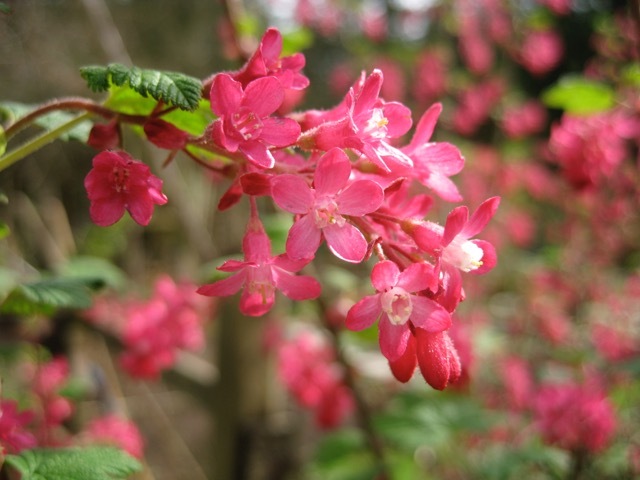 She enjoyed the watching the hummingbirds at the hot pink flowering currant bush, the bumblebees in the crocuses and rhododendrons, and like a child, she never lost her appreciation for the wonder of the spring eggs laid in abundance by our chickens and ducks, just in time for Easter……and her birthday. Flowering current blossom, when they bloom the hummingbirds arrive! Mom was a holiday person. Every traditional holiday was celebrated at home during our growing up years. Decorations, carefully packed away, were brought out for Christmas, Valentine’s Day, St Patrick’s Day, Easter, etc. As she aged, she continued to do so in her home on a smaller scale, but in the last years, the roles reversed and I would set up her decorations, always buying and adding some new, pretty little item just to give her something. It was my way of thanking her for all the years she brightened our lives with holiday celebrations. We live in a culture deficient in rituals and celebrations and I always enjoyed and appreciated the little ways she honored the holidays. Happy April memories: Mom with Easter animals, a birthday orchid in front of flowering currant, an Easter picnic 2 yrs. ago., her lovely smile on her 90th birthday. Center, one of my favorite photos of mom as a young person. 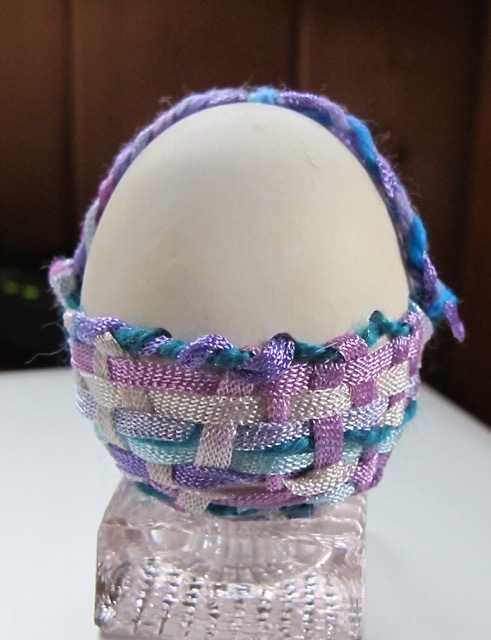 Last year’s post, Egg Enchantment, showed the little window eggs I make. 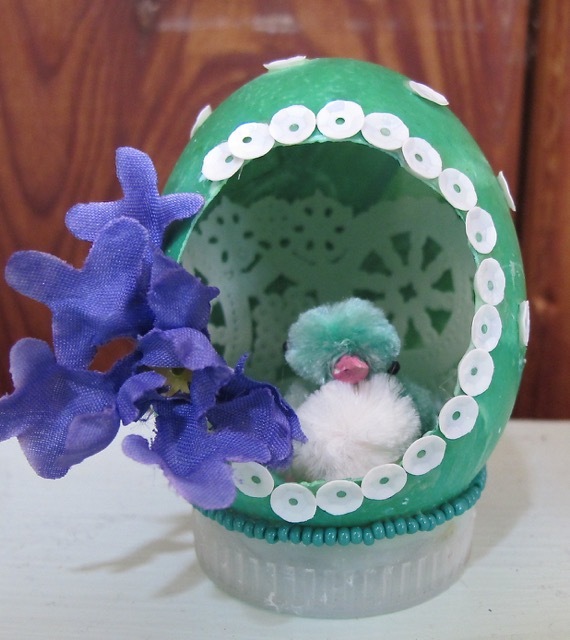 This little green chick lived in an old chicken egg, from my childhood, that broke. It is now housed in a sturdy new duck egg home! So I’m missing Mom. Missing doing something for her. Missing showing her the fresh eggs laid by our young duck, sharing with her new ways of decorating them, showing her the new daffodils we planted, blooming brightly in the sun. There are sad memories mixed in with happy ones. Last year she had a major fall a few days before her birthday, leaving her spirit shook and her face bruised. We took her out for a birthday lunch and she was quiet, but enjoyed a hardy meal. A second fall a few weeks later, on Easter Sunday, resulted in a stroke that went undetected until I arrived and noticed her struggling with speech. Inadequate care at the adult family home she moved to just a few months earlier required a second move. But though I am ‘free’ of the extreme stress, management, demands and ‘crises’ of her care, I’m also void of the person with whom I have shared the simple pleasures of Easter and spring throughout my life. 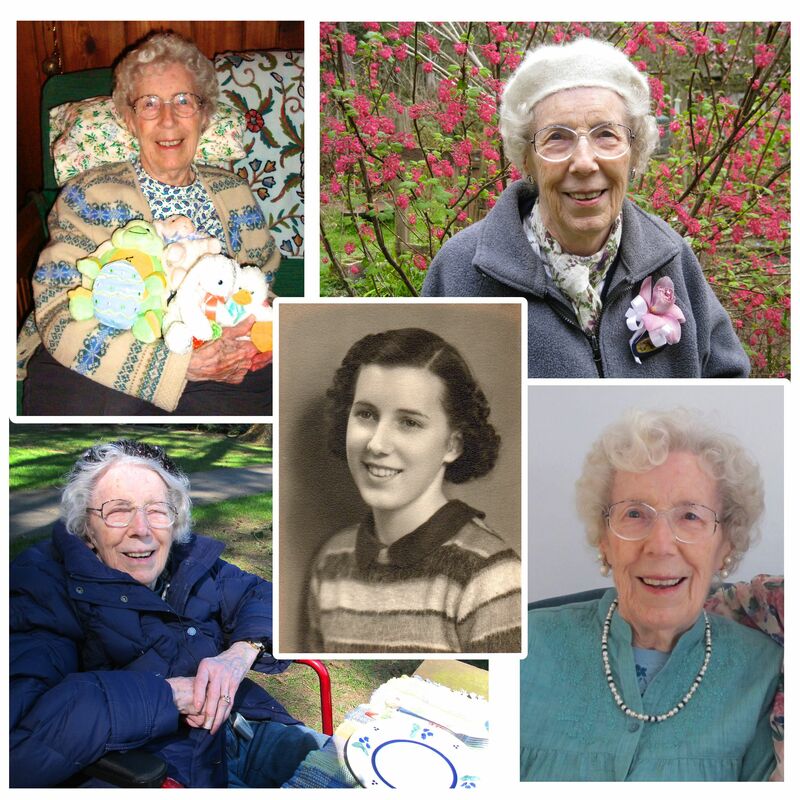 With her April birthday, and Mother’s Day a month later, spring, Easter, and the joys of watching life unfold, are all wrapped up with Mom memories in my heart and mind. That’s all. Thanks for reading as I indulge in a bit of wallowing. 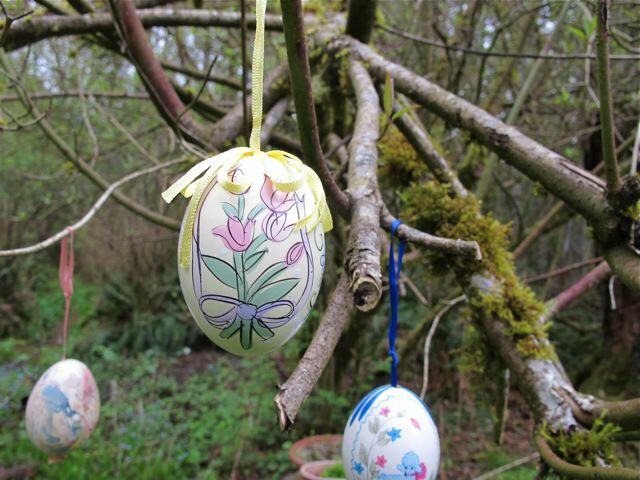 Enjoy previous Spring posts: Egg Enchantment, Hare Hare Everywhere, A Season of Celebrations, A Season of Forgiveness. 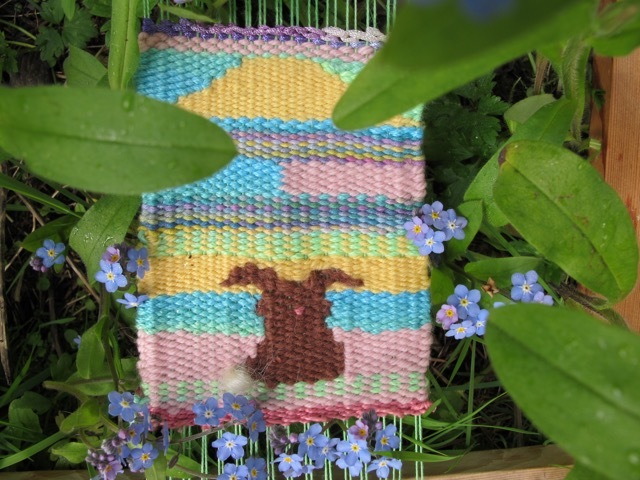 A little bunny weaving to wish you Happy Easter! It’s been a few years since I pulled the boxes of Easter decorations out of the attic. Among the bunnies and a few misc. 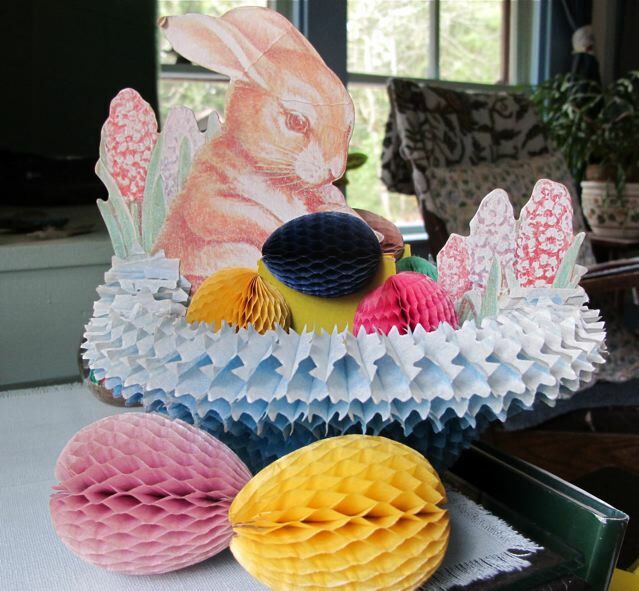 decorations are egg boxes filled with colored eggs. 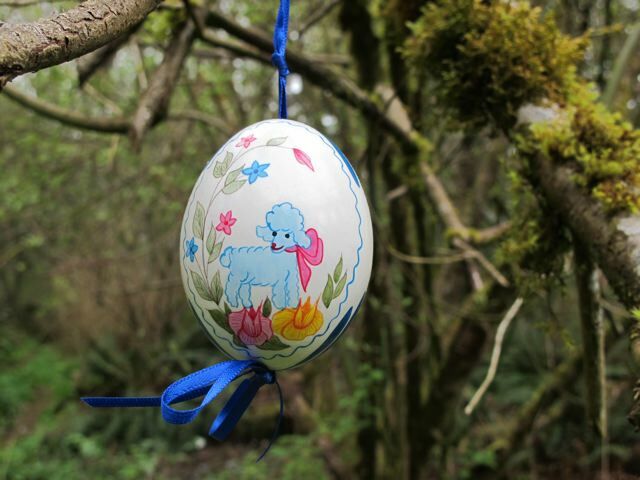 Full of personal history, delightful whimsy, and beautiful colors, many of the eggs have become very fragile over the years. Some, already cracked or broken, are still carefully tucked into the boxes, too precious to part with. Eggs seem to hold within their ovoid shape a magic that has captured human fascination forever. 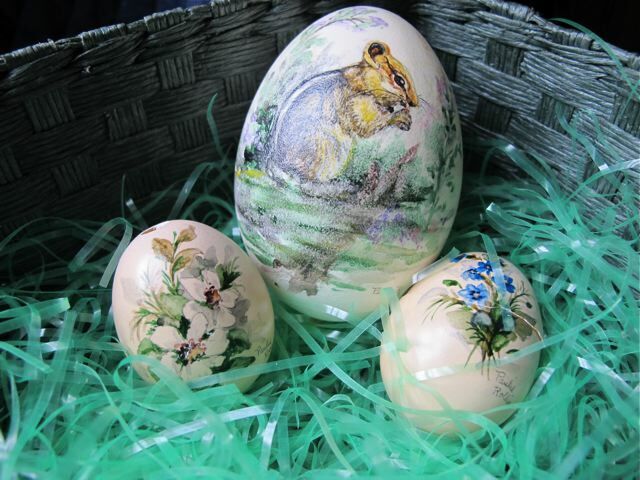 Books and the internet are full of stunningly bejeweled, intricately painted, and carefully carved eggs. I share with you some of my more humble collection. 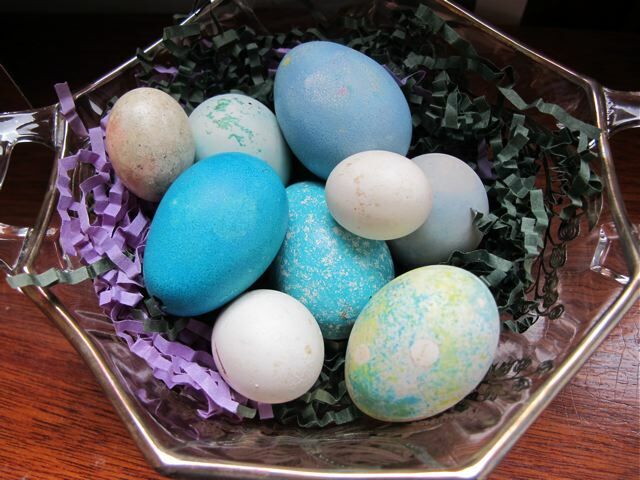 A basket filled with an assortment of dyed eggs. Decades of raising bantam chickens and Muscovy ducks gave me an abundance of eggs to ‘play’ with, using natural dyes, food coloring, oil dyes, and various techniques for decorating them. 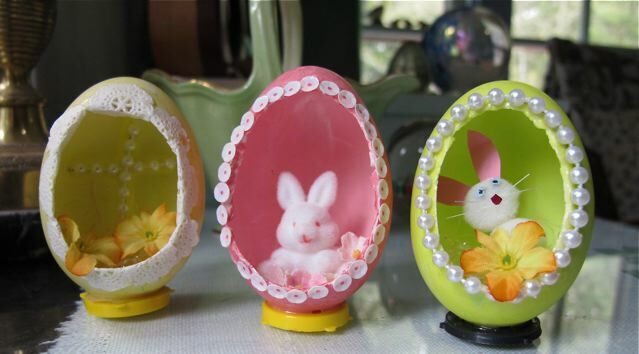 Growing up I was enchanted by the few ‘window eggs’ we had. I found the large, hard-shelled Muscovy eggs perfect for my own creations. In 1987 I traveled to Sweden and Germany to visit friends in each place who I had met when they were traveling in the USA. 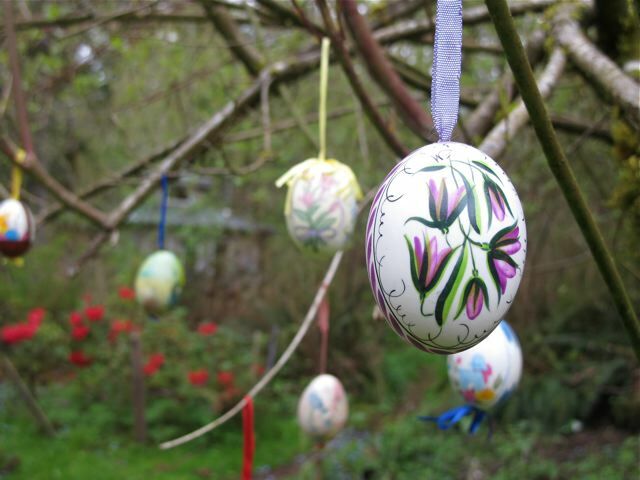 I wanted to be in Germany during the Easter season because many of our Easter traditions have Germanic origins. Spending the Easter holidays with my friend Shiva in Nuremberg was a memorable experience. Previous to the holiday we traveled throughout Bavaria. Many towns had a town square with an Easter egg tree. Nuremberg is famous for it’s Ostermarkt (Easter Market), a huge market in the town square with vendors selling many crafts (and some non-crafts). I was so enchanted, I kept going back to the market to buy more eggs, each in it’s own individual box. Like most the eggs at the market, the ones pictured are from Yugoslavia. 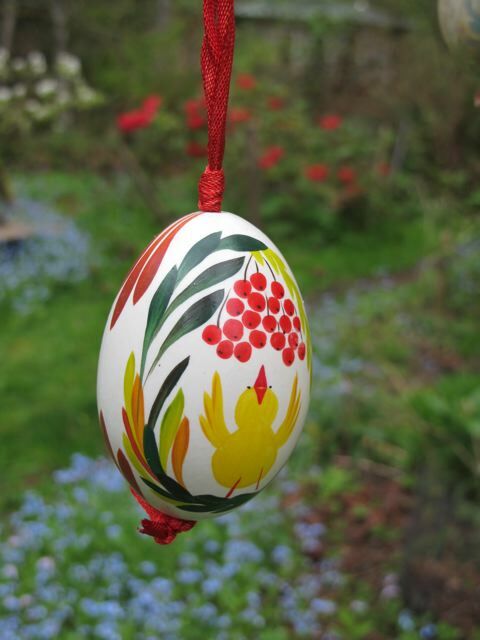 When I flew home I carried on the plane a basket full of two dozen hand painted eggs, many of which I gave away. Here are a few of them. 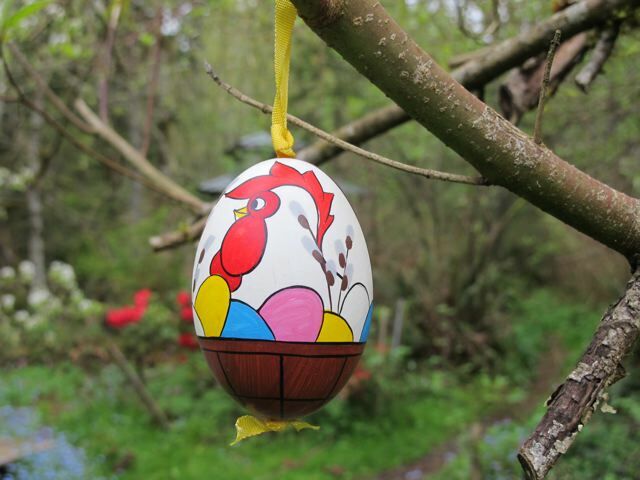 There is more I could share about my Easter in Germany, a culture rich in both sacred and folk traditions. I did adopt the tradition of making a small Easter tree inside each year. Not this year, so no pictures. This cute little lamb reminds me of another German Easter tradition, a lamb cake. The cake Shiva made was simply and traditionally decorated with powdered sugar, and of course scrumptious! This chick seems to be offering up praises as it reaches for the berries! My good friend Terra painted for me the lovely egg pictured below probably 30 years ago, using the same techniques used by Ukrainian artists to paint eggs. It is not hollow, but rather left to dry, the yolk becoming like a rubber ball inside. 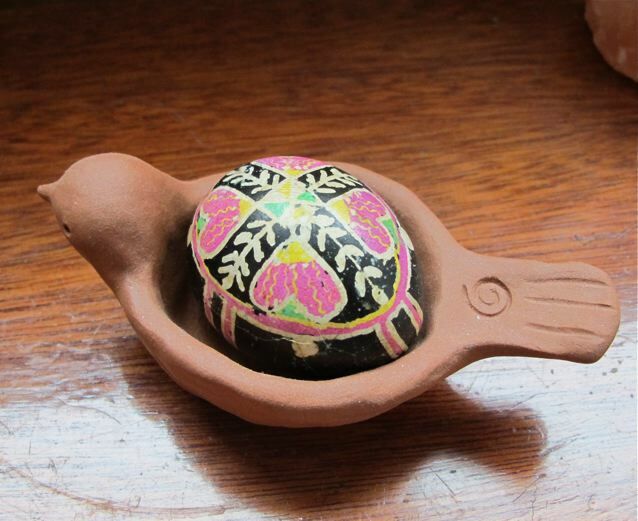 This is how the intricately painted Ukrainian eggs are preserved, making an egg that will last for years and be less fragile than a hollowed egg. 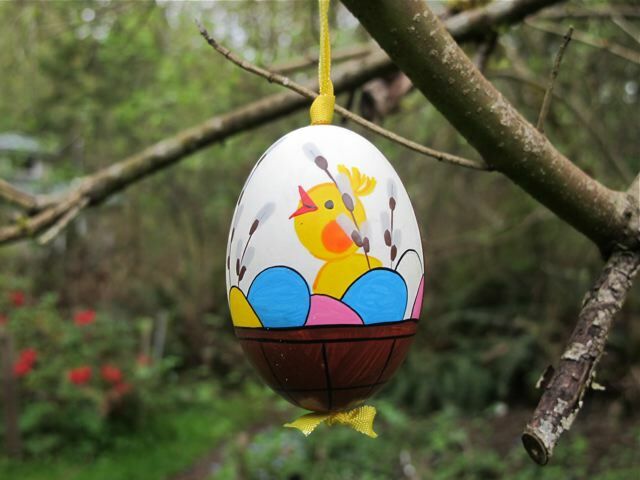 This egg sits in a special little clay bird’s nest made by Phoebe of Daily Bird Pottery. When a chicken lays it’s first egg it is often small, sometimes as tiny as a songbird egg. Called a ‘pullet’ egg, because the hen is in her ‘pullet’ (think teen-ager) stage. I’ve saved many of these small eggs over the years. Some, too tiny to blow out, I let dry in the frig for a year before decorating. 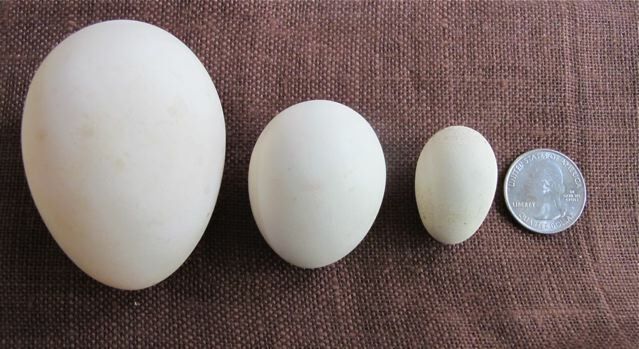 (The photo left shows a Muscovy duck egg, which is a little larger than a store bought “jumbo” egg, a small banty egg, and a tiny pullet egg compared to a quarter.) Below a small glass “basket”is full of dyed and un-dyed pullet eggs. The two eggs in the upper left corner in the basket below were decorated when I was a child with dyes that ‘floated’ on the water. I always remembered doing these and loved the swirling rainbow effect. 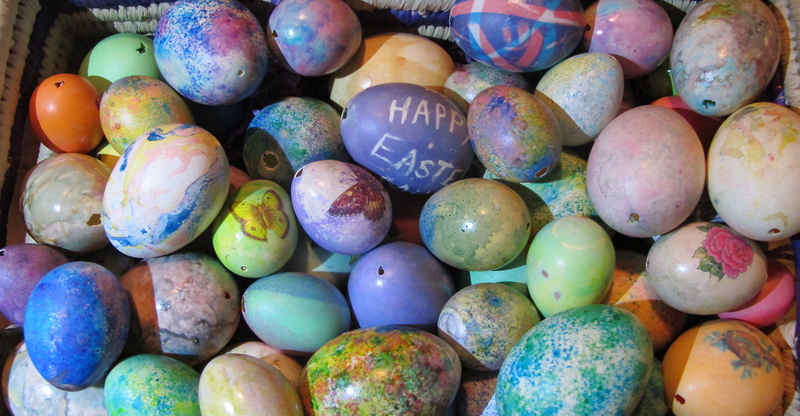 With my abundance of eggs to experiment with, one year I went looking for and found similar dyes and made a new ‘batch’. 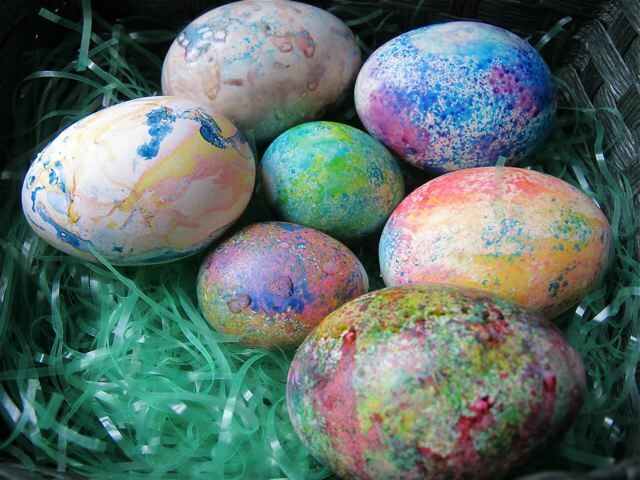 The new dyes were thick oils, they produced vivid colors and felt thick on the egg. I love the colors, but wish I could find the more muted rainbow dyes of my childhood that seemed to absorb into the shell. Speaking of old eggs! 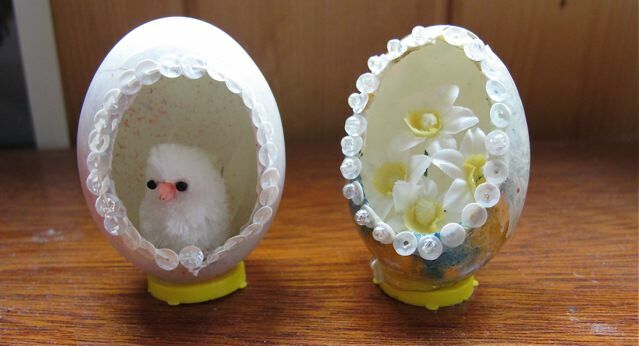 Here are some vintage paper eggs, also fragile with age. 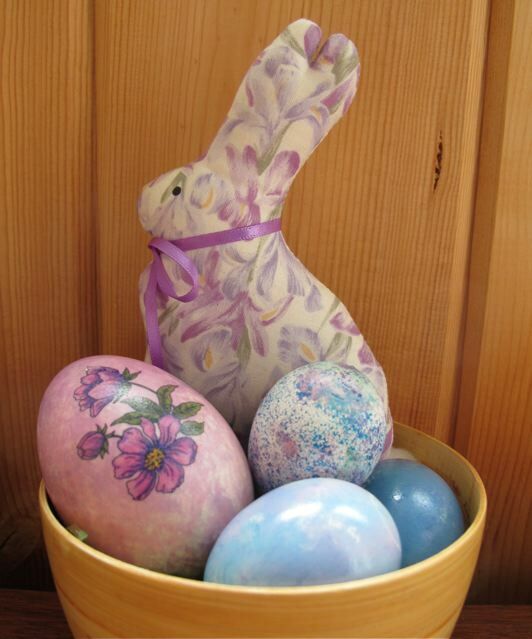 Remember these honey-combed paper eggs? There is more I could write about Easter eggs, and eggs in general, but you might be egged-out by now! Though we no longer have hens laying eggs, there is a box full of duck eggs from a very broody duck, and a container of carefully dried and preserved little bantam eggs in the frig waiting for decorating magic! Wishing you a lovely and peaceful Easter! 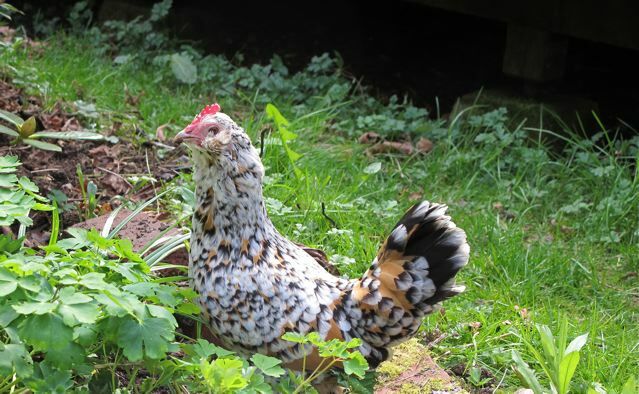 Millie is a Belgian Bearded D’Uccles Mille Fleur, like our Old English Game bantams, she is a ‘true’ bantam, not a miniature of a larger breed. Spring has arrived. Happy Spring! My first spring in 35 yrs. 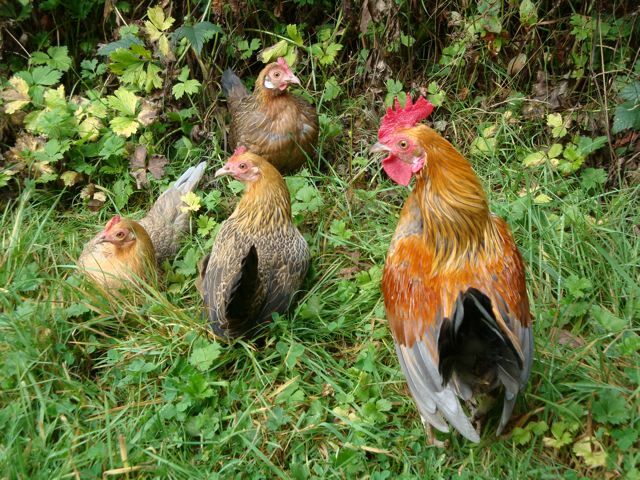 without a rooster and his harem clucking around, scratching for grubs and worms, running to the site of any human digging for easy pickings, and generally acting like spring chickens, regardless of their age. After the loss of two hens and two roosters last year, Millie, our ‘rescue’ chicken, who moved in a few years ago, is the lone survivor. The last one standing. She does not like to be in the open, she has never ventured into the garden, has no interest in where the action is. In her little coop she is either on the roost in the house, or, if outside, under the house . She always wants something overhead…a roof, a floor, a Rhody bush, anything will do as long as there is no sky above her. Before Abby the dog arrived last summer, Millie had learned it was safe to go from coop to back porch, where she hung out, under the partial roof, looking for handouts, preening, and talking to anyone who would listen. Millie is a talker, she will carry on a conversation with me for quite sometime. When I walk by her coop and call out “hello Millie”, even if she is inside, she answers. 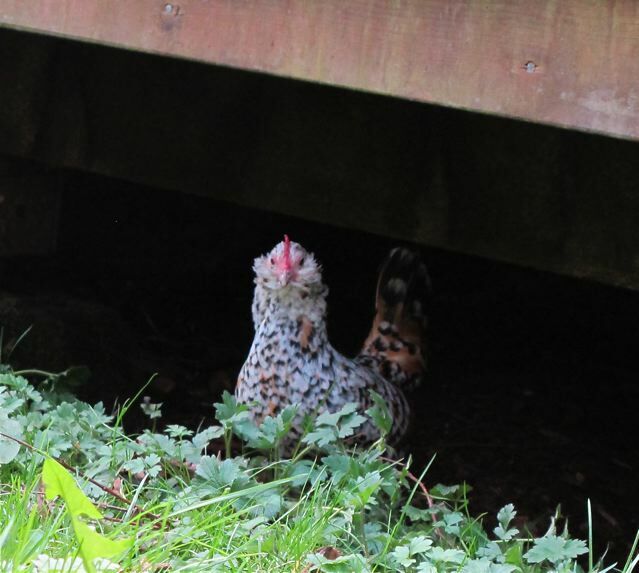 The arrival of Abby, the murder of Studdily, her rooster coop mate (from an unknown predator), the death of the last old hen from our Old English Bantam flock (she moved in with Millie after the rooster died), was all too much. 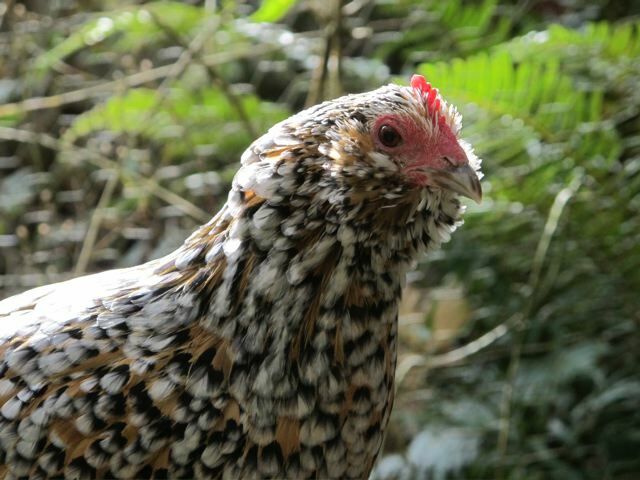 Before living with us, Millie had been the lone survivor of a flock of chickens who were slaughter. Alone again, Millie became a reluctant recluse. She is happy for our company, Mike pets her good-night every night when he closes up her house, and most winter days I would go out to feed her sunflower seeds from my hand, holding and petting her. She would tell me she appreciated the attention, after all, chickens are not designed to be loners. When the temperatures dropped into the teens, she got to live in my office. She enjoyed that! Millie, this afternoon, hiding in the shade of a huge fern, discovered lungwort (pulmonaria) blooms are tasty! But spring is here and she is tired of her solitary life. She lets me carry her to where I am sitting in the sun, or pulling weeds. She hangs out briefly, but soon finds cover…running under, or onto, the porch, burying herself in a big fern, or finding shelter under a rhody. She and Abby ignore one another. Abby does not make the connection between the chicken breasts in her homemade food and Millie, but one look at Millie, you can see it is hard to connect her to most anyone’s idea of a chicken! Millie has body control ‘issues’. Occasionally she stumbles and falls over, my theory is it’s caused by the feathers sticking out from her feet, even though they are clipped back. When she runs, or tries to fly, once she gets started there is a momentum she seems unable to control…..stopping is a clumsy crash landing. Through it all there were chickens. The squawks, soft cooing and clucking from the coop as beautiful bantams, in colors of red, brown, black and gray, talked among themselves…working out relationships, raising families, sending out alarms; rooster crows and clucks to call hens for a tasty morsel, were the background music to my life as it unfolded, with its unpredictable adjustments. Chicken coops were built, moved, rebuilt. 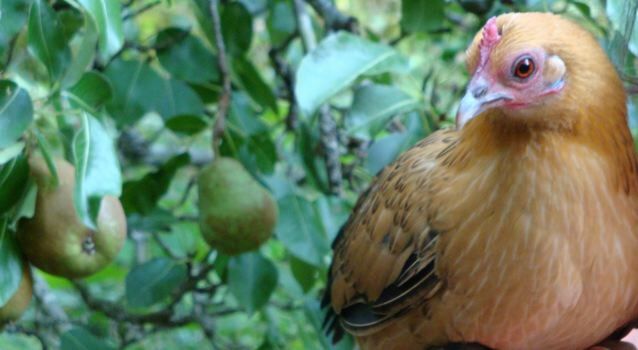 Chickens were lost to predators, unknown causes, old age. New chickens came from in-flock baby chicks (it is true, banties make wonderful moms), some were ‘planned’ families, some not. Once while I was away, a house sitter let the chickens out and did not count them when they came back in evening. 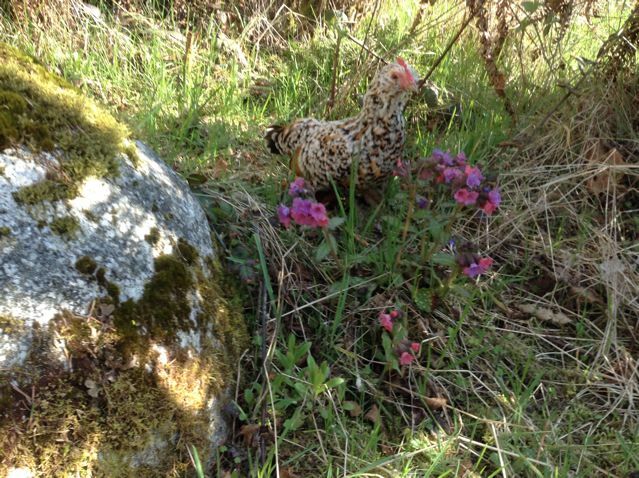 A hen had disappeared, only to reappear weeks after I returned, with nine tiny chicks. Only a banty could hide, and survive three weeks (the time it takes for eggs to hatch), in a forest that is home to raccoons, coyotes, weasels, the occasional bear, bobcat, and cougar. 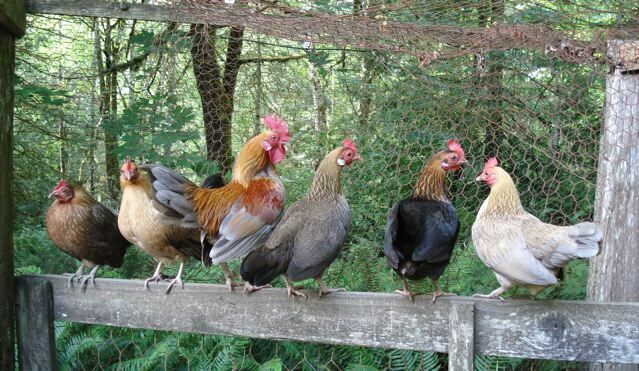 Occasionally, when the flock dwindled, I would bring in new chickens. 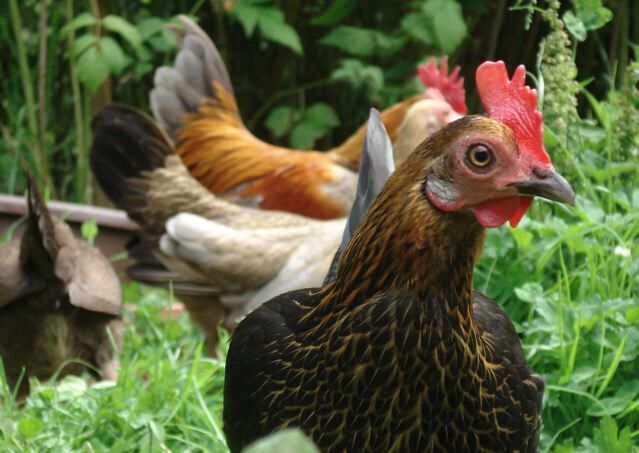 Feed them, love them, do your best to protect them, and bantams provide endless entertainment, abundant stories, the comfort of their gentle voices…and eggs! 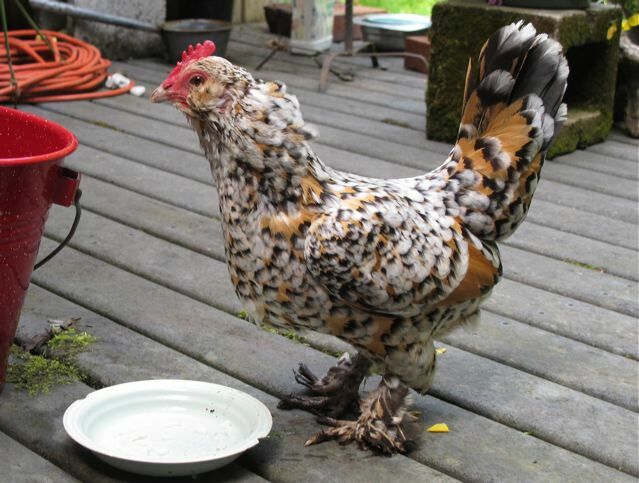 I cannot speak for the large chickens raised for meat, as well as eggs, for I’ve always had bantams. They are very alert and fly into trees and hide in bushes when they sense danger, they know how to survive in the ‘wild’. The past five years or so, with our dwindling geriatric flock, there have been no eggs, but their company in the garden, their clucks, coos and crowings, from dawn to dusk (and the occasional night crowing!) were my assurance that one part of my country-life, childhood dream, had come true! Now there is just Millie, the final chapter in my life with chickens.